Highlights: Thai Cooking Class, 2 Hour Thai Massage, Thai Silk Village, Front row seats Kickboxing!. One of the best days I’ve ever spent on an organised tour, relaxing, enjoyable and hectic from start to the end. First up Our tour leader was amazing today, moving the included events around so we can could all do the optional activities we wanted. 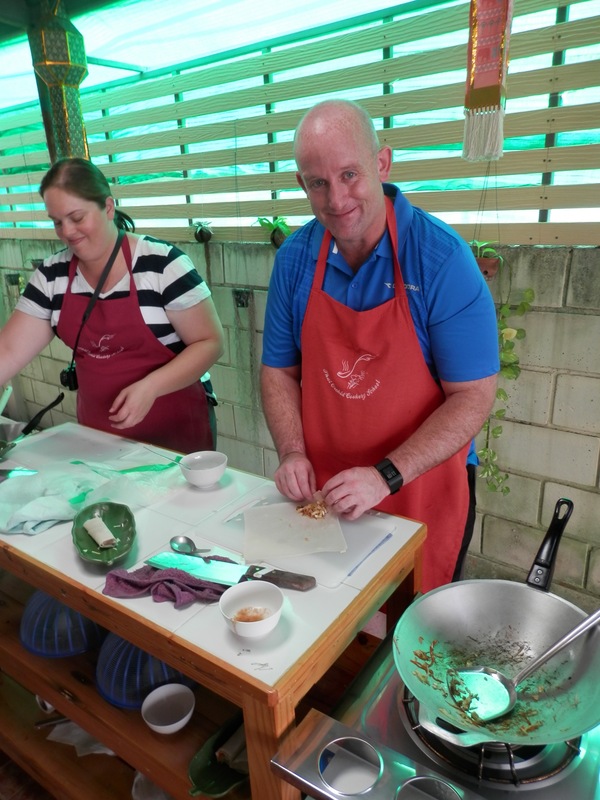 We started with a Thai Cooking Class which started with us going to a local market and getting an explanatation all the different fruits and herbs available at the market and then buying our ingredients for later cooking. The company we used was the Thai Orchid Cookery School a small but well run outfit. Over the course of the next 4 hours we learnt and then cooked springs rolls, chicken stir fry, chicken curry, and for desert a stream banana cake. There was something about getting you hands into making your lunch that made it taste extra special. This then lead us onto a Thai massage at the Chiang Mai Massage Palace which the entire group participated in. This was two hours of intense full body work which started with gentle foot washing before entering the massage room. I shared a massage room with Graham which meant at times by looking at him I could see what my massage therapist was doing to me. We had the medium strengthen Thai massage which made only about 40% of the time did they work us very hard. Definitely got a lot of work done on my legs and right shoulder, they must have been the tension spots as I felt those pressure points! At the conclusion everyone felt loose, happy and relaxed. I think we could have all gone to sleep for the rest of the day but there was still more to do. Next up was a visit to the Thai Silk Village to see how they made their various products from the very start. This meant right from the start so we saw silk moths laying eyes, silk worms emerging, silk worms eating and growing etc right up to harvesting their silk. From here it was watching them colour the silk and then apply it. This is literate everything under the one roof. I couldn’t help myself and made several purchases including a couple of silk ties for work. It made we think about getting a suit made later in the trip. We also went to a silver shop, because it was so late in the day we only got a small demonstration on how they use silver to made different objectives. Inside the store was some amazing pieces including this stunning silver jewelled crown that cost around $5,000 USD. While there were cheaper items, and there was no doubt everything was a good deal you really need either a lot of money or to please your partner to buy such higher quality products. We headed back for a short break and a shower at our hotel before walking to the market district for dinner. This was right next to the open environment (but covered roof) for Muaythai, or kick boxing which about half the group attended. This was incredible. I’ve been to Muaythai a few years back in Bangkok sitting about 15 rows back but here we sat in the front row. The front row is the splash zone, as guys were taking hits sweat was coming our way. You could hear and clearly see the high velocity hits during these fights. It was incredible entertainment. The boxers fight about once a week which is hard to believe seeing how hard it is to fight a 5 round match. I’d never want t upset one of these fighters. Most of the matches had local Thai fights versus overseas fights, for example there was a Chinese, Italian and Australian fights. A brilliant, hectic day and we are only on day three! This entry was posted in Travel, World Trip 2016 and tagged GA-Discover-SE-Asia, Thailand. Bookmark the permalink.